It’s time for the next instalment of the “Design story” series. Up this time for a belated introduction is the “Grecian Goddess” collection, a perennial favourite. If you’ve been paying attention, you’ll have sussed that my modus operandi is pretty simple. I keep it straight forward and to the point (or atleast I try to), to this end the name pretty much nails the gist. This timeless collection seeks inspiration from the romantic Grecian style (much beloved by brides today), and is given a contemporary spin. Beautifully draped dresses, whispy, delicate and classical are the perfect foil for these pieces. The designs are an enduring hit with brides who love the romance of this look, designs often wing their way around the world to sunkissed beaches for dreamy destination weddings. Shame I can't accompany them! I envisioned the pieces being worn in an up do but I've seen them looking stunning in long loose flowing locks and short pixie crops alike. These images from pinterest, including the much pinned Jennifer Lopez and Blake Lively are images, are copied to me countless times by brides as the sort of look they are striving to acheive. The collection comprises a series of headbands and vines. They are comfortable, flexible and easy to wear, particularly key if you are having a destination wedding and won't have the same chance to experiment before the day. The vine pieces can be secured with pins, elastic, ribbons or small combs could be attached. 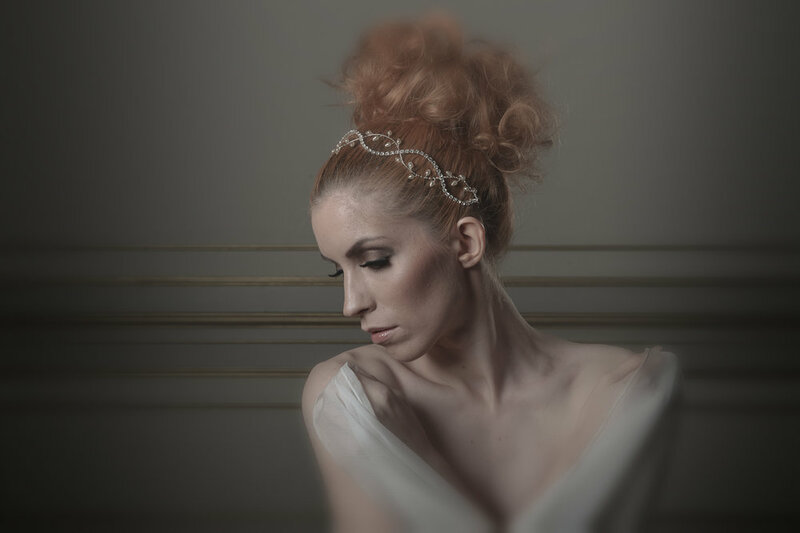 I've used pearls, crystals and diamantes to complement both embellished or simple detail free dresses alike, and as with everything I create, each piece is completely customisable for each bride. It was a bitterly cold, crisp day and our model was a superstar! It was the third outing of the "Dream Team", yes, you know the script by now..... incredible photographer Ally Byrom and fabulous make up artist, Victoria Farr (read my other "Design story" posts to find out more). I had a poorly child lob a spanner in the works part way through the shoot, so I couldn't stay for the full duration but the team soldiered on like champions and created stunning results. If there was a Brownie badge for juggling/wielding a smoke machine, fans, a reflector and wafting fabric simultaneously whilst protecting our models modesty in a rather larger dress than matched her slender frame, then the intrepid Victoria Farr should be awarded a sash full of them. I wish Ally had shots as evidence of this major feat, better still a video would have made a fine Youtube clip, speeded up to the Benny Hill theme tune. The "Location" , Rise Hall (as seen on Channel 4's Restoration Nightmare with Sarah Beeny). The "Model" was the fabulously striking and modest Charley Green. We learned that smoke machines set off fire alarms, and that not bringing enough bulldog clips to a shoot is a major faux pas, otherwise I think we nailed it. A big shout out to Deborah Moore for the great dresses. Rebecca Robinson for her excellent white background product images. Last but by no means least, Helen Davies at Rise Hall for allowing this shoot to take place.